All three sites assist the user by placing the cursor within the search box upon page load and allowing the user to press the ‘enter’ or ‘return’ key to submit the query. In addition, they reserve a consistent location for the search box, although only Bing and Yahoo display the search box at both the top and bottom of the page. They also display the query in the search box after submission, which serves as confirmation to the user of what they entered. This may of course differ from how the query is actually interpreted, particularly if an auto-correct or ‘did-you-mean’ is applied. Retaining the query in the search box also provides a convenient starting point for query reformulation (which we’ll cover in a future post). Inviting the user to select a category in advance helps them narrow down their search more rapidly, and enables the refinement options shown with the search results to be tailored specifically to that product category. 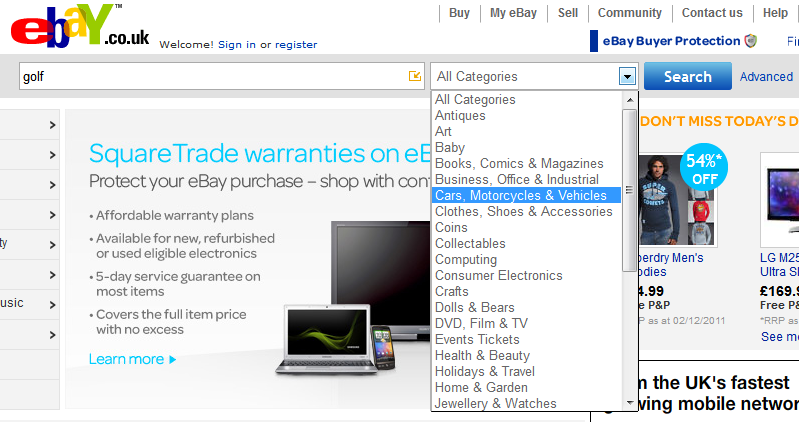 For example, a query for ‘golf’ in Cars, Motorcycles and Vehicles would present a very different set of refinement options than the same query in Sporting Goods (see the earlier posts on faceted search). Users with high domain expertise can therefore benefit greatly from scoped search, particularly if they are seeking known items. Conversely, this approach is less well suited to users with low domain expertise, as they may be unsure which category to select at the outset (unless they take the time to learn and understand the site’s category structure). A poor choice can lead to them over-constraining their search which increases the likelihood of zero results and reduces the potential for serendipitous discovery. 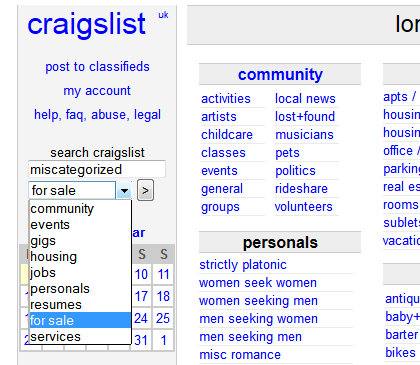 Classified advert site Craigslist, for example, offers several category choices – but which one would you choose to find focus group opportunities? It turns out the correct answer is under ‘et cetera jobs’ or ‘gigs’. 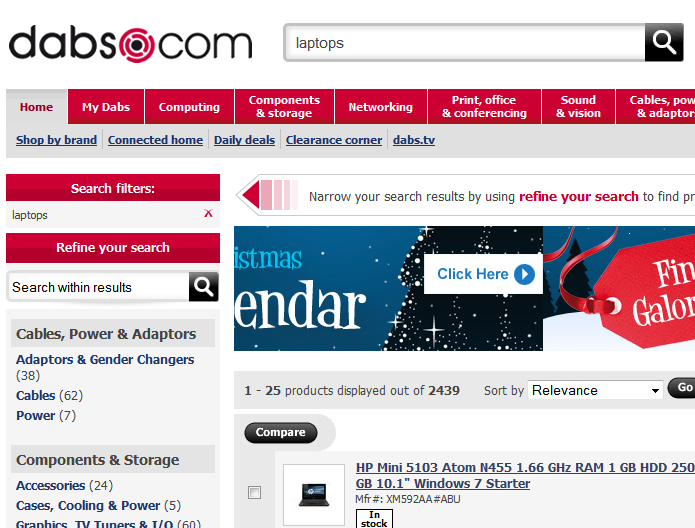 For this reason, scoped search is usually set to ‘all categories’ by default. The problem is further compounded if the scope restriction is applied to subsequent queries which are unrelated to the original information need. As we saw in previous articles, search is a dynamic process in which the results of one query can change the immediate goal (or even the work task itself). In cases such as these, it is prudent to apply a fall back strategy that searches across all categories, particularly if searching within one category produces zero results. For example, a search on WARC for “text analytics” produces zero results for Charts, but the same query could have been productively applied to ‘All Categories”. In all cases (but particularly those for which zero results are returned), it is important to clearly display the scope of the search as part of the results. 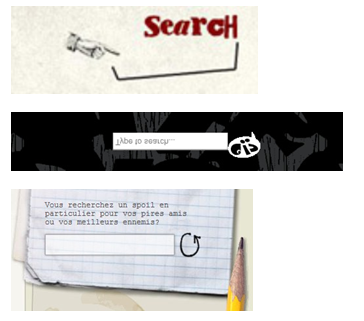 It is common to think of the search box as the ‘gateway’ to the search experience; the most evident way to initiate an information seeking episode. But there are many cases when keyword search can be productively applied later in the information journey. By allowing users to search within an existing set of results, the query acts as a kind of refinement, narrowing down the results in a manner similar to that of faceted navigation. Alternatively, search within can be integrated with the standard search box, using a radio button or checkbox to toggle between the two different types of input. In such cases, the toggle control needs to be sensitive to the application context (i.e. it should be disabled if search within results is not currently possible). In addition, selecting the ‘search within’ checkbox should also remove the current query from the search box (since it is redundant within the current result set). Since search within offers the user the ability to enter ad hoc refinements which may not match the current result set, it is quite possible that zero results may be returned. Although this outcome is generally best avoided, there are various techniques for dealing with it productively (which we’ll cover in a future post). 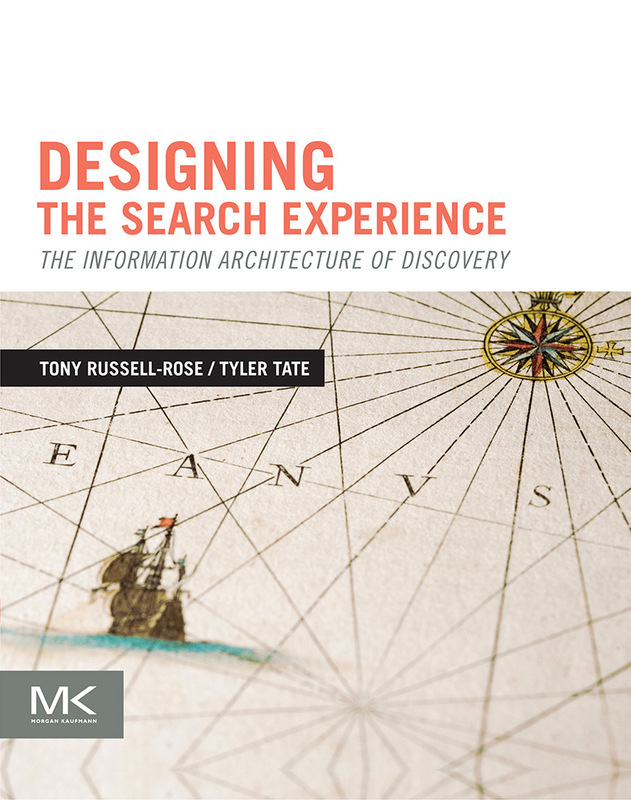 But now, with a greater understanding of search as a dynamic, progressive dialogue, there seems less value in adopting an approach that requires the user to make such a commitment in advance of even the first exchange. If you were about to initiate a conversation with a stranger, would you ask that they to choose a tone of voice first (e.g. ‘normal’ or ‘sophisticated’)? A far more productive strategy would be to demand the minimum at the outset, then modify your interaction as the discourse unfolds, reacting and responding meaningfully to each exchange. Of course, there will always be applications for which it makes sense to divide the audience into two or more groups, such as medical information sites that serve both clinical professionals and the public. But in such cases, a more informed strategy may be to consider how the whole experience (i.e. content, navigation, transactional functionality, etc.) could be adapted for that audience, rather than assume that search alone deserves special treatment. An effective search experience puts ‘advanced’ search tools in the hands of all users, as and when they are able and willing to use them. In practice, many of the instances of ‘advanced search’ as described above have transpired to be either unnecessary, underutilized, or both. We touched on this issue previously, when we reviewed the ways in which faceted search can provide a more elegant and scalable approach to advanced search. In the examples above we’ve looked at a number of ways we can search using various forms of typed input. But entering keywords isn’t the only way to express a query. In fact, there are host of other ways we can articulate an information need. In fact, natural language has often been portrayed as the “killer app” for search, prompting the creation over numerous start-ups over the last decade or more. However, up until a few years ago, disappointingly few of these had had a lasting effect on the mainstream search experience. This is partially due to the inherent challenge of developing robust algorithms for natural language processing (NLP). But it also reflects the dynamics of the search experience itself: to effectively support human information seeking across the widest range of task contexts, we need to facilitate an open, scalable and interactive dialogue. Answering questions may be part of this, but it is not the whole solution. 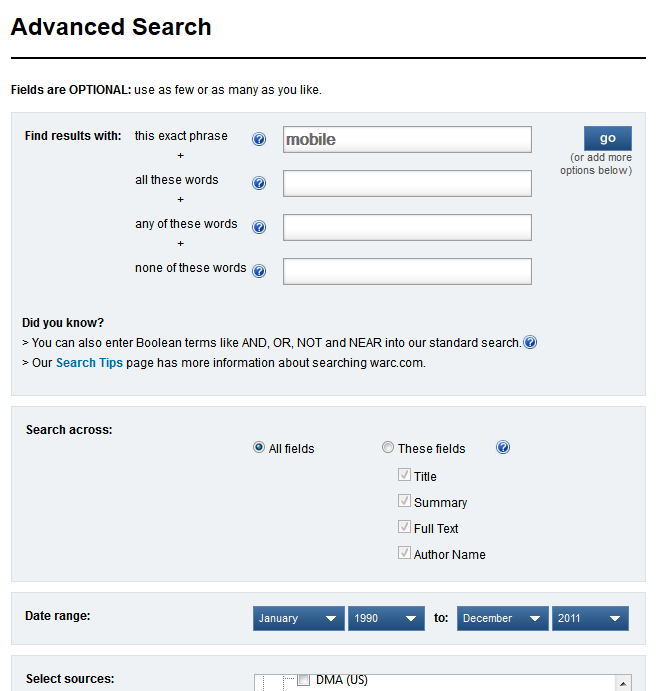 For some types of application, techniques such as faceted search can facilitate the search conversation in a more transparent fashion than an exchange of purely linguistic constructs. 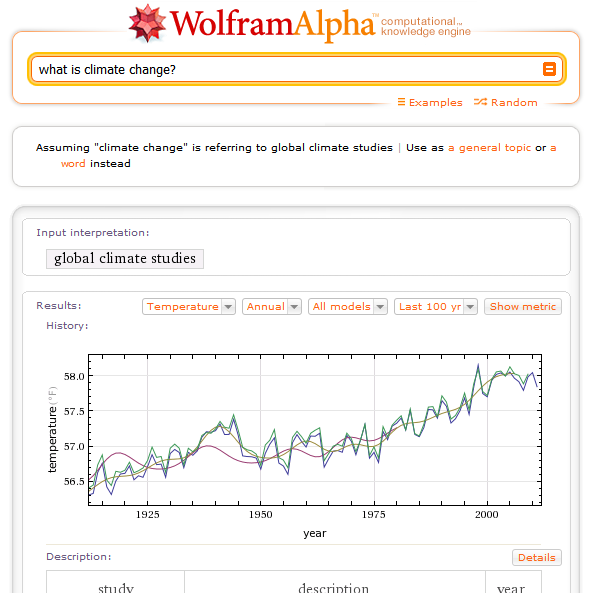 Similarly, Like.com (now part of Google Product Search) allowed users to use images to describe parts of queries which would have been difficult to describe using keywords alone. And beyond visual queries, services like Shazam allow users to record music clips which it then identifies by matching them against a database of audio files. These alternative forms of input serve to remind us that keywords may be the simplest form of input, but they are not always the most natural. Sometimes our information needs go beyond words. Instead, we should choose input methods that match the broader information landscape. Very informative and useful post! 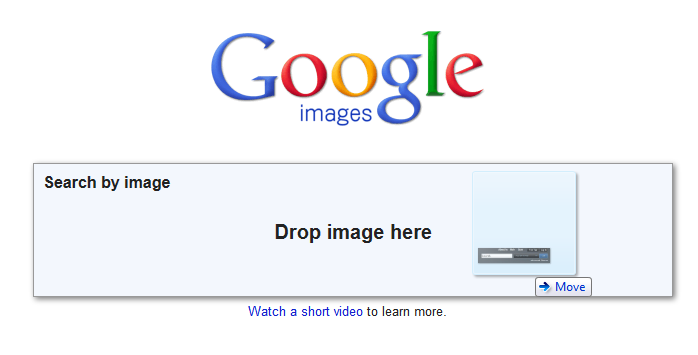 I always wondered about Google not having a search box at the bottom of search results. Why is that? While reading this post I started wondering if that is to encourage people to scroll up to re-try search and, in the process, have another glance at AdWords that, of course, increases the chance of those ads getting clicked on…..